ChessTitans.xml contains settings for windowed mode. ChessTitansMCE.xml contains settings for Windows Media Center mode (launch with -mce parameter). Set the graphics quality slider to maximum. 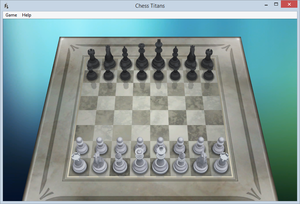 Chess Titans and other bundled games are unavailable after upgrading to Windows 8. Recover the Chess Titans files. Copy the recovered Chess folder somewhere convenient. Download a hex editor (e.g. HxD). Open Chess.exe in the hex editor. 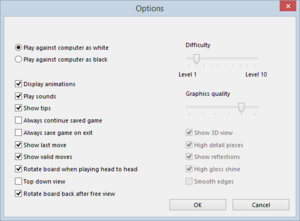 Chess Titans will now run on Windows 8 and later. This page was last edited on 30 August 2018, at 14:23.